« EOS-5D Mark III or EOS-1D X? Today’s blog post marks 40 days in a row with a new post, a new record by far that should continue for at least another week or two. To show your appreciation, we ask that use our B&H and Amazon affiliate links for all of your B&H and Amazon purchases. Please check the availability of all photographic accessories in the BIRDS AS ART Online Store. We sell only what I use and depend on. We will not sell you junk. We know what you need to make creating great images easy and fun. And we are always glad to answer your gear questions via e-mail. 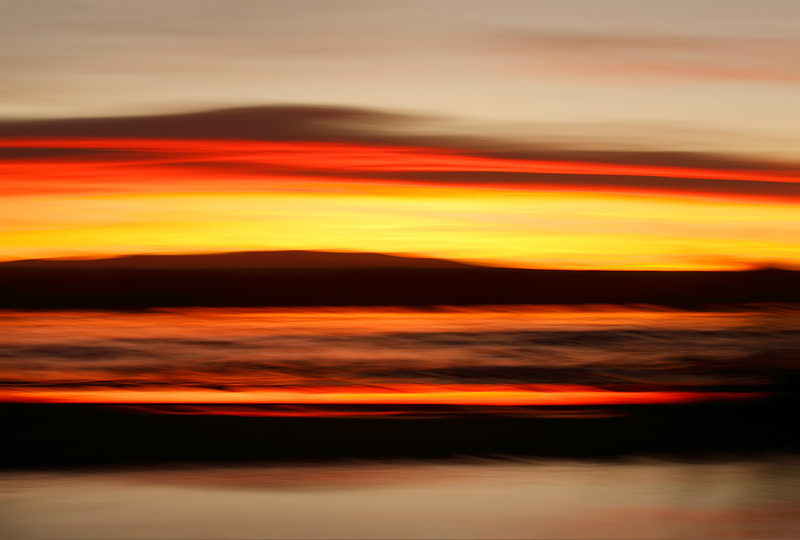 This vertical pan-blur was created at Bosque del Apache NWR with the hand held Canon EF 70-200mm f/2.8L IS II USM lens, the Canon 1.4x EF Extender III (Teleconverter) (at 280mm), and the EOS-1D Mark IV (now replaced for me by the Canon EOS-1D X . ISO 200. Evaluative metering +1 2/3 stops as framed: 1/15 sec. at f/4 in Tv mode. Central sensor/Rear Focus AF and pan vertically. Click here to see the latest version of the Rear Focus Tutorial. Click on the image to see a larger version. On rare occasions, action can be on the slow side at Bosque del Apache, NWR in San Antonio, NM. And sometimes, there are just no birds to photograph. At these uncommon times folks should understand that there are a wealth of non-avian subjects at the refuge worthy of their time. Those include the young willows and stands of the invasive salt cedar that line the ditches. Both of these are ideal fodder for honing your vertical pan-blur techniques. The panning rate determines the degree of blurring but it is the timing of the shutter release that determines the image design. It takes practice to achieve the framing that you want but once you are in the field, digital is free so it is a good idea to experiment at length. It is likely that something like 1 out of every 10 images will look good on the back of your camera and for every 10 that look good on the back of your camera you might wind up with one very nice keeper, or better yet, a family jewel. This image was created with the hand held Canon EF 70-200mm f/2.8L IS II USM lens (at 98mm) and the Canon EOS 5D Mark III Digital camera body ISO 400. Evaluative metering +1 1/3 stops as framed: 1/8 sec. at f/11 in Tv mode. Central sensor/Rear Focus AF on the photographer and pan vertically. Click here to see the latest version of the Rear Focus Tutorial. Click on the image to see a larger version. On a rare not-so-great IPT morning Denise Ippolito and I stopped to teach the boys and girls how to create pleasing blurs. Everyone was working on vertical pan blurs of the young willows when BPN‘s Cheryl Slechta, a moderator in the Out-of-the Box Forum, where creativity reigns under Cheryl’s fine leadership, came by and shared her “Harold blur.” Everyone loved the image. .
We loved it so much that we got Bear Boat IPT veteran Harold Klein to pose for us. He was a great sport and his camouflage outfit was perfect. As always we encourage folks to create lots of images in hopes of getting one good one. I created about 25 Harold Blurs and kept only the one above…. This image was also created with the hand held Canon EF 70-200mm f/2.8L IS II USM lens (at 98mm) and the Canon EOS 5D Mark III Digital camera body ISO 50. Evaluative metering +1/3 stop as framed: 1/2 sec. at f/14 in Tv mode. Central sensor/Rear Focus AF on the black stripe at the bottom and pan horizontally. Click here to see the latest version of the Rear Focus Tutorial. Click on the image to see a larger version. 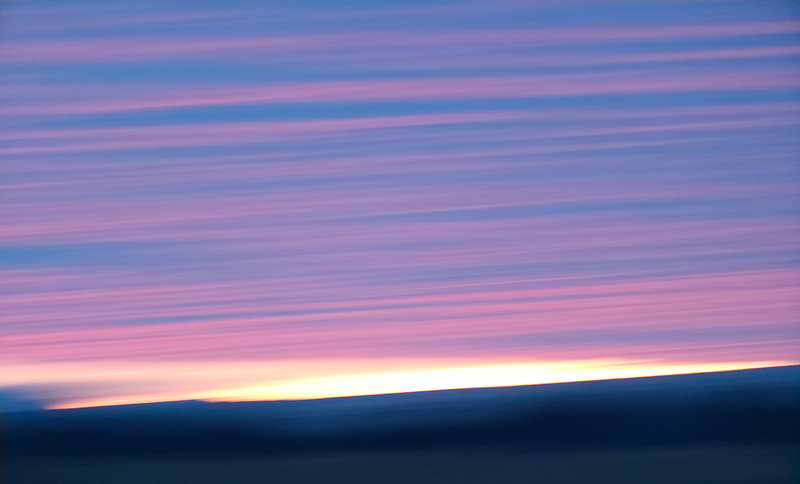 When the pre-dawn sky is spectacular but the birds are sleeping late creating pleasing blurs is always an option. Working on a tripod when creating pan blurs makes it easy to keep the straight lines straight and level. With the lower half of the frame here relatively dark (as compared to the sky) I did not add much light for fear of blowing out both the YELLOW and the RED channels. Again, the shutter speed and the panning rate determine the degree of blurring and the timing of the shutter release determines the framing. This image was also created at Bosque del Apache NWR, this one with the Gitzo 3532 LS carbon fiber tripod, the Mongoose M3.6 head, the Canon EF 200-400mm f/4L IS USM Lens with Internal 1.4x Extender (at 386mm) and the Canon EOS-1D X. ISO 5000. Evaluative metering +1 stop: 1/4 sec. at f/4 in in Tv Mode (with ISO Safety Shift). Central sensor/AI Servo/Surround–Rear Focus AF on the ridge and pan horizontally. Click here to see the latest version of the Rear Focus Tutorial. Click on the image to see a larger version. If you would like to learn more about creating pleasing blurs check out our A Guide to Pleasing Blurs by Denise Ippolito and yours truly. This 20,585 word, 271 page eGuide PDF is illustrated with 144 different, exciting, and artistic images. The guide covers the basics of creating pleasingly blurred images, the factors that influence the degree of blurring, the use of filters in creating pleasing blurs, and a great variety of both in-the-field and Photoshop techniques that can be used to create pleasingly blurred images. The book is laid out in landscape format to make for easy viewing and easy reading on any decent computer monitor. We teach you many different ways to move your lens during the exposure to create a variety of pleasingly blurred images of flowers and trees and water and landscapes. We teach you to recognize situations where subject movement can be used to your advantage to create pan blurs, wind blurs, and moving water blurs. We teach you to create zoom-blurs both in the field and during post-processing. 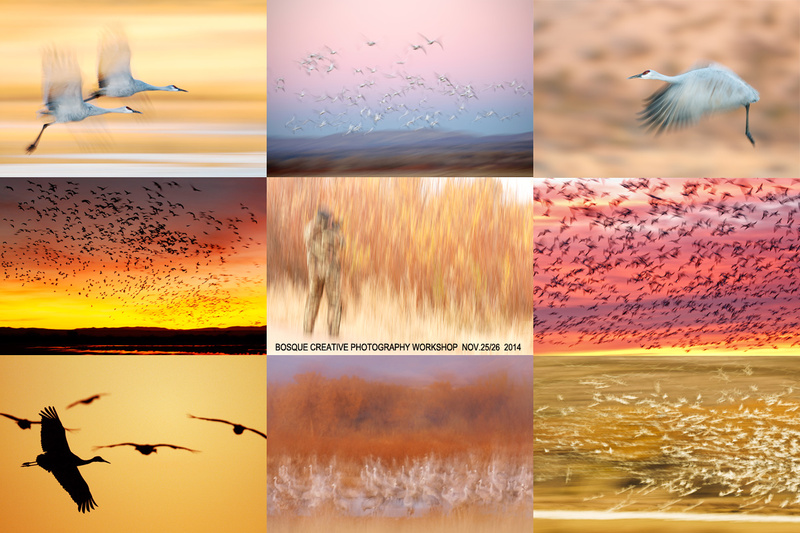 Artie shares the techniques that he has used and developed for making blurred images of flocks of geese in flight at his beloved Bosque del Apache and Denise shares her flower blur magic as well as a variety of creative Photoshop techniques that she has developed. With the advent of digital capture creating blurred images has become a great and inexpensive way to go out with your camera and have fun. Do know that over the past decade more and more prestigious contests that are looking away from traditional photography towards more out of the box stuff have chosen to honor a great many intentional blurs. While many folks think that making successful blurred images is the result of being a sloppy photographer nothing could be further from the truth. 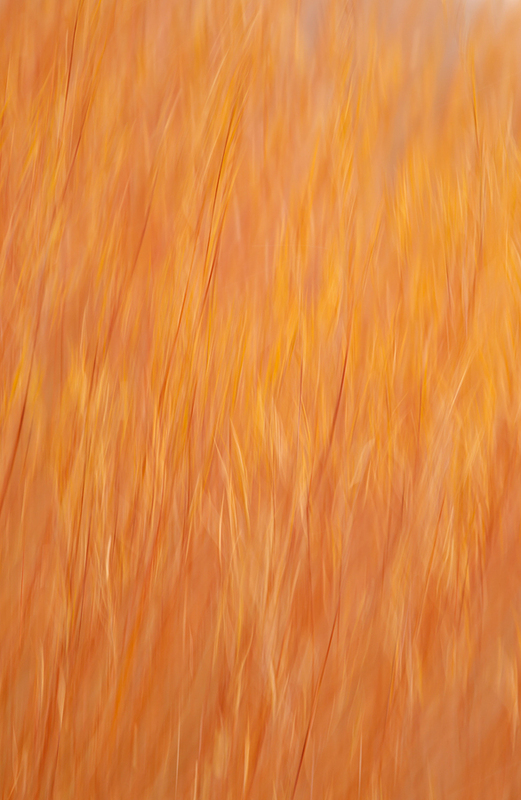 In “A Guide to Pleasing Blurs” Artie and Denise will help you to unleash your creative self. This in-camera Art Vivid HDR image was created with the Gitzo 3532 LS carbon fiber tripod, the Mongoose M3.6 head, the Canon EF 70-200mm f/2.8L IS II USM lens (at 145mm) and the Canon EOS 5D Mark III ISO 400. Evaluative metering +/- 2 stops around 1/60 sec. at f/8 in Av mode. Central sensor/Rear Focus AF on the nearest branch just above center and re-compose. Click here to see the latest version of the Rear Focus Tutorial. Click on the image to see a larger version. Kudos and thanks again to the afore-mentioned Cheryl Slechta who has helped Denise and me out on several Bosque IPTs. On the 2012 IPT, most of the group was waiting for a big duck blast-off without much success. Cheryl went for a walk to see what she could see and came back to share some of her backlit cottonwood images. Several of us were really impressed. I advised folks with 5D Mark III bodies that using a tripod for creating any HDR images is the best plan as it assures accurate alignment of the images. As I usually do my favorites were Art Vivid captures and as usual, I brought the JPEG into Photoshop and reduced the Saturation about 10 points. 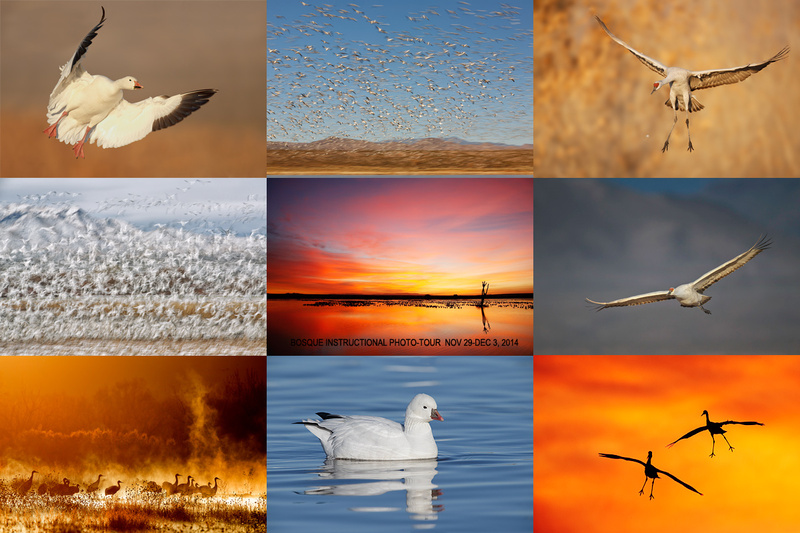 This Art Vivid in-camera HDR image was also created at Bosque del Apache NWR with the Gitzo 3532 LS carbon fiber tripod, the Mongoose M3.6 head, the Canon EF 200-400mm f/4L IS USM Lens with Internal 1.4x Extender (at 282mm) and the Canon EOS 5D Mark III . ISO 400. Evaluative metering +/-2 stops around +1 2/3 stops: 1/200 sec. at f/7.1 in in Av Mode. 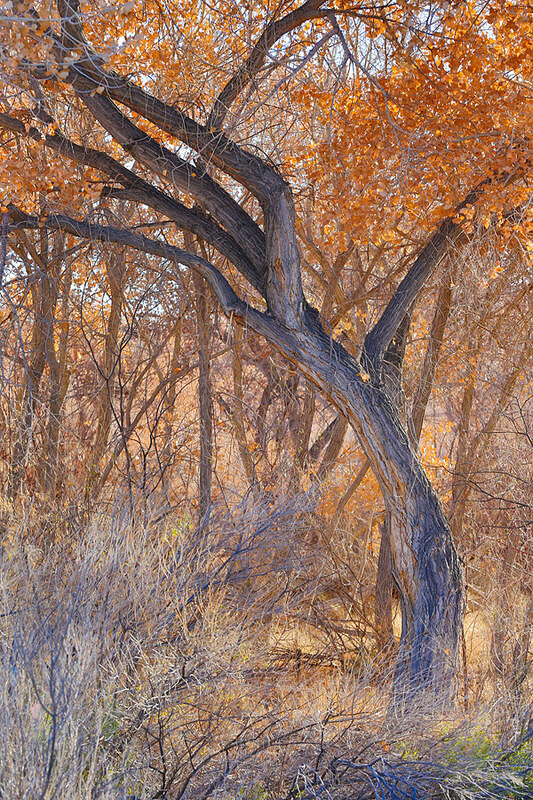 Central sensor/AI Servo/Surround–Rear Focus AF on the large cottonwood on the left and re-compose. Click here to see the latest version of the Rear Focus Tutorial. Click on the image to see a larger version. I love using long glass for landscape and scenic photography. Doing so enables you to extract the most interesting parts of the scene in a way that I wide angle lens cannot do. In addition, long effective focal lengths compress the elements in a composition making them appear closer to each other than they actually are. 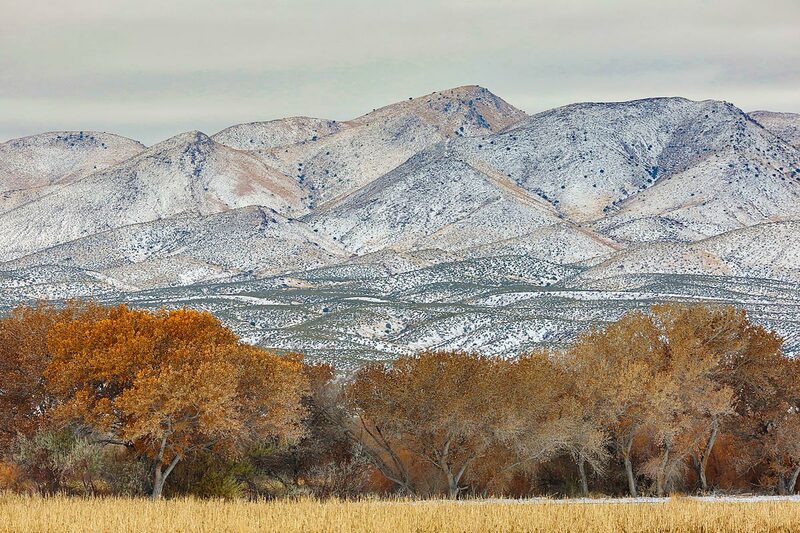 As the 282mm focal length used here did to the cottonwoods and the low mountains. I loved using my 200-400 at Bosque for both landscapes and the pre-dawn and sunrise fly-ins and fly-outs. This in-camera Natural HDR image was created with the Gitzo 3532 LS carbon fiber tripod, the Mongoose M3.6 head, the Canon EF 70-200mm f/2.8L IS II USM lens (at 110mm) and the Canon EOS 5D Mark III ISO 400. Evaluative metering +/- 2 stops around +1 1/3 stops: 1/80 sec. at f/16 in Av mode. Central sensor/Rear Focus AF on the vegetation along the ditch 1/3 of the way into the frame and re-compose. Click here to see the latest version of the Rear Focus Tutorial. Click on the image to see a larger version. As regular readers know, I love and use the Art Vivid in-camera HDR style most of the time. But with the image above, it the JPEGs were looking way too YELLOW so I created a few with the Natural style and loved the results. My 50-50 NIK pre-set did wonders for this one as did the nice crop from the top and a 10-point increase in Saturation. I erased the 50-50 Tonal Contrast/Detail Extractor layer from the sky with a Regular Layer Mask. Learn everything that I know about my 5D Mark III in my 5D Mark III User’s Guide. Included are 5D III exposure fine points, handling the WHITEs, all top LCD and camera control buttons, the 5D Mark III drive modes, how to manually select an AF sensor, choosing an AF Area Selection Mode, Menu Item access, coverage of almost all Menu Items and Custom Functions including the following: Image Quality, Auto Lighting Optimizer, Highlight Tone Priority, AF Configuration Tool (includes details on the custom setting that I use), Acceleration/deceleration tracking, Tracking sensitivity, Lens drive when AF impossible, Orientation linked AF point (I love this feature on the 5D III! ), Highlight alert, Histogram display, Auto rotate, Custom Shooting Mode set-up, Safety shift, using the Q button, and setting up rear focus. In addition you will learn my settings for both the In-camera HDR and the Multiple Exposure features. The guide is–of course–written in my informal, easy-to-follow style. Take a moment to leave a comment and let us know which of the images above is your favorite and why you chose it. 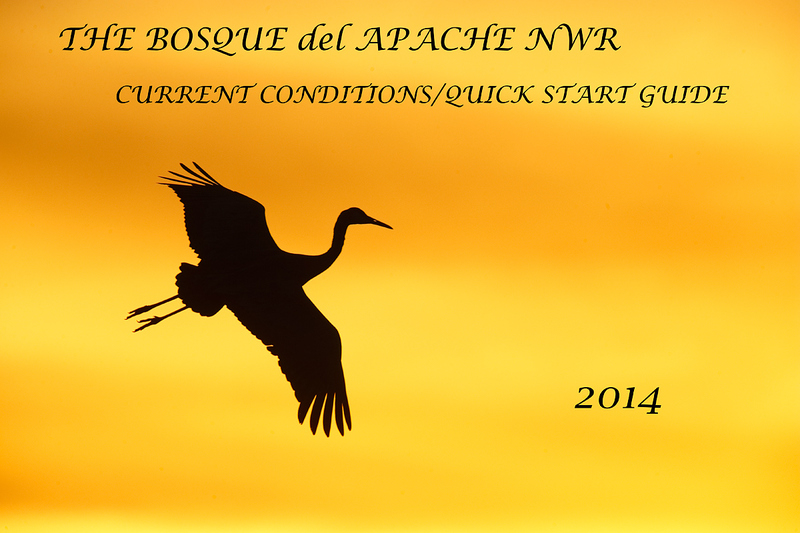 The 2014 Bosque Quick Start Guide/Current Conditions Update is available as a stand alone purchase. See below for details. 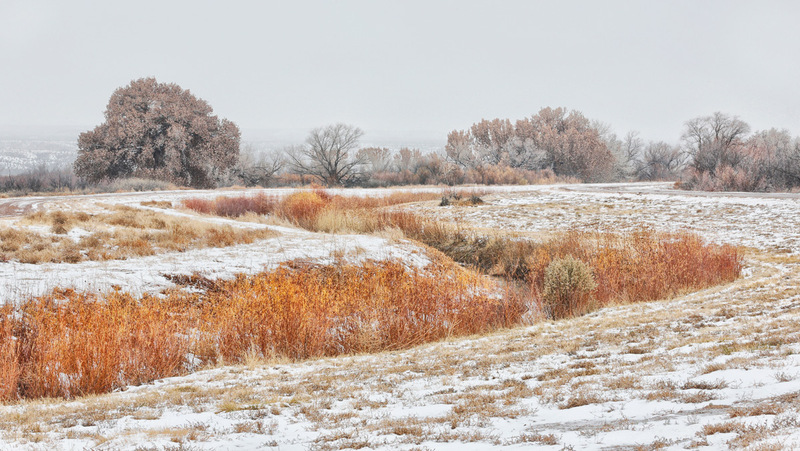 The 2014 Bosque Quick Start Guide/Current Conditions Update was sent on Tuesday to all the folks who have previously purchased our Bosque Site Guide. In this new, stand-alone guide I will enlighten you as to what’s new at the refuge and what’s old that works. Where should you be at dawn with a north wind? Which crane pool is better? What’s with that new pond? Where are the two best spots to be at sunset? Where should you be at 7:30am on a cloudy morning? All of those questions are answered in detail in the new Quick Start Guide/Update. The Quick Start Guide contains a basic synopsis of the complete guide including the best pre-dawn strategies, the best crane pool strategies, the best afternoon strategies, and the best sunset strategies. Heck, BAA Site Guides are the next best thing to being on an IPT. This new e-Guide includes 41 images, all but one created in 2013. Most are spectacular and inspiring, all include an educational caption designed to teach you to be in the right place at the right time in the right weather. Take advantage of my 20 years of experience at Bosque by getting yourself a copy of this great new guide right now. If you own the Bosque Site Guide and did not receive the update please cut and paste (or screen capture) the top of the first page of your Bosque Site Guide into an e-mail and shoot it to Jim via e-mail with the words “2014 Bosque Update” cut and pasted into the Subject Line. If you purchase our Bosque Site Guide ($50) today, you will receive the complete Bosque Site Guide in one e-mail, and then you will receive the 2014 Bosque Quick Start Guide/Current Conditions Update at no charge to you. We are, as we did last year, offering the 2014 Bosque Quick Start Guide/Current Conditions Update as a stand-alone purchase for only $25. You can order your copy right now in the BAA Online Store by clicking here. Your PDF will be sent via e-mail. You and Denise are an amazing team and it was a treasured experience to learn from and photograph with you both. You have gifted me a new ‘exposure’ discipline, which has catapulted me up to the level I’ve wanted to be at. I had seen the value before, largely from following your blog, and had started to embrace it, but with the workshop I find myself solidly and confidently established in a new and photographically more powerful place. Thank you for your blog, as well. It is a great learning tool. I hope to do more workshops with you two! Thanks for everything. Ciao for now, B. Happy Day After Thanksgiving to all, The experience at Bosque, for me, was a once-in-a-lifetime journey. Before leaving home, I knew that it would be special trip but upon arrival and experiencing just a few minutes with all of you, I knew I was into something extraoidinary. The group’s passion and talent was infectious. As we know, the setting was so very special and the birds outdid themselves. I envy you getting photo #2. 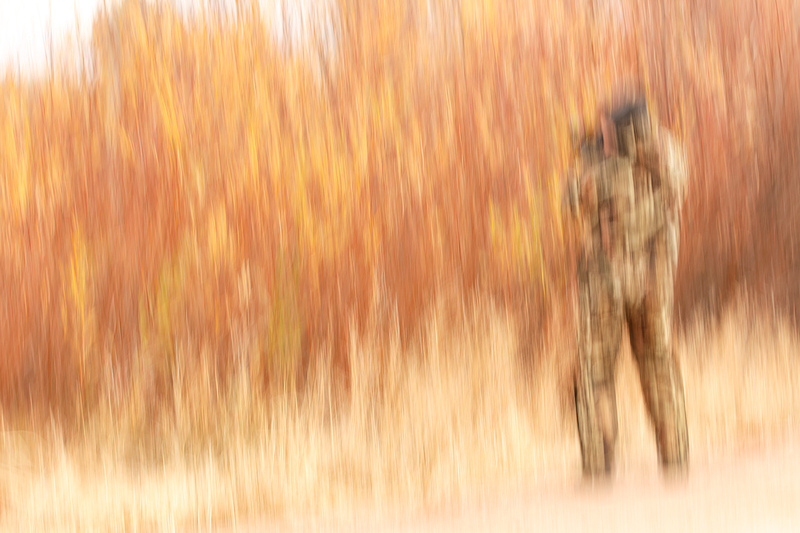 I have been trying for years to catch a sasquatch on film. 🙂 And a few years ago I saw a Mountain Lion, covered in mud, not far from the spot where that images was made…. Loved the backlit Cottonwood-comp, color, overall emotional feel ! Artie, We can’t thank you enough for taking the time and effort to publish your blog. It is done artistically in a most pleasing manner and we all learn from it. You are a rare person who cares about others. I learn something every day and look forward to reading it. We can’t begin to thank you enough! My favorite picture is the one of the tree that you took using HDR. It flows from the bottom right to the top left with pleasing colors throughout the photo. It is a cheerful picture. I certainly like all of the pictures but that one stands out to me. Thanks for your more-than-kind words Peter! And thanks again to Cheryl. There are lots of ways to thank me for my hard work here: remember to use our B&H and Amazon affiliate links; join a BAA IPT; patronize the BAA Online Store; and learn from our educational books and e-Guides and my MP-4 Tutorial Videos. The first is my favorite, the colours the flowing lines the originality. That’s it!! The first and the last are my favourites. Looking them over again I have to the mention the cottonwood image also a favorite. I am not narrowing it down much but they are the ones I like best.